MENLEA warranty covers any defect caused during product production and delivery. MENLEA can offer you full refund or free replacement. Refined top quality cowhide genuine leather，which is both soft and durable, ensuring a nice feel and look. Wireless readers can not get through our RFID protection. In an era while electronic digital pickpocketing increasingly occurrence MENLEA offers reliable RFID security (13.56 MHz). 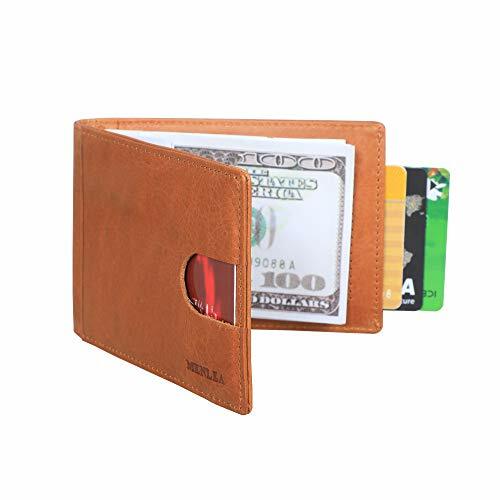 With improved money clip that is easier to put in and take out cash/bill. Most wallet are bulky & difficult to carry when out traveling. With our Slim Wallet you can hold up a few cards and clip bills inside while slimming down your pocket! We are deeply committed to detail. We closely monitor every step – leather selection, cutting, sewing, great craftwork. - Leather products will last for a lifetime with the right care, so we kind suggest you avoid excessive exposure to water, heat and sunlight. - If you have any question please feel free to contact us, we will reply you in 24 hours. Add the MENLEA Wallet in your shopping cart and slim down your back pocket!